St Brelade secured a third consecutive season in Jersey's Premiership after they won a tense relegation play-off 1-0 against Rozel Rovers at Springfield. Kyle Hampshire's 91st-minute penalty was the difference between the sides. It means First Tower and St Lawrence will be promoted to the top flight after a restructure to add an extra team to the Premiership. 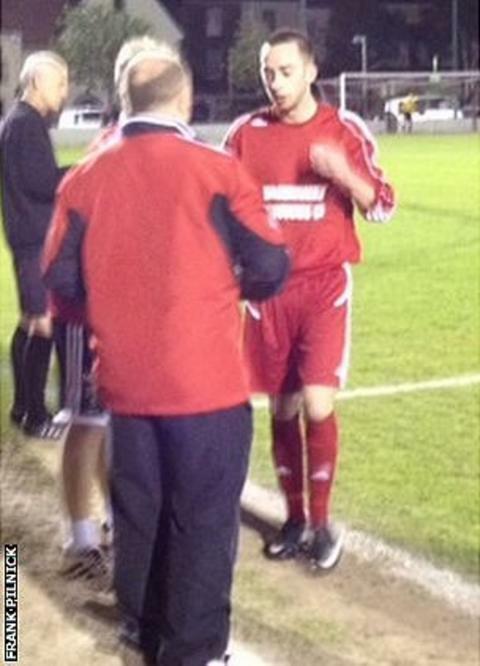 "On the balance of play I think we did deserve to win the game," St Brelade manager Gary MacDonald told BBC Sport. But MacDonald conceded that his side were lucky to get the spot-kick was secured their survival. "With the amount of pressure we put on them at the end something had to give, but had that penalty been given against us I would have been disappointed," he added. "I think we controlled the game but in the second half Rozel made it very difficult for us to find any space, so it was a relief to get a penalty albeit a fortuitous one."